Pearl sago, or sabudana, as it is known in Maharashtra, is mainly eaten during religious fasting in preparations such as sabudana khichdi and sabudana vadas. In Southern India, it is commonly used in making pappadams, vadas and payasams. I first came across Nupur’s recipe for sabudana khichdi a couple of months back, and have been making it very frequently since then. This traditional Maharashtrian favorite is now a regular at our place since it makes a quick, tasty and filling breakfast/brunch during weekends. Here is Nupur’s recipe and this is what I did. I stuck to the original recipe for the most part, but also threw in some carrots for color, crunch and sweetness. I do not know if the dish will still remain a “fasting dish” with the addition of carrots. Mix the fluffed sago, crushed nuts, sugar and salt together and set aside. Heat oil in a pan and add the cumin seeds followed by the green chillies. Next, add the cubed potatoes and carrots and cover and cook till the vegetables are done. Add the sago-peanut mixture to the pan and mix well to combine with the seasoned vegetables. Cook on low heat for about 2-3 minutes and turn off the heat. 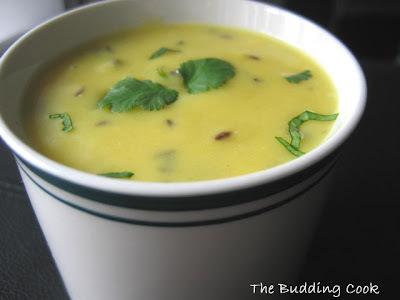 Squeeze some lemon juice over the khichdi. Serve hot. We had this with some tomatillo chutney. I have cooked a lot from Nupur’s blog ever since I first stumbled across it some two years back. These are just some of her other recipes that I remember having tried out. This goes to Zlamushka who is hosting the second round of Tried and Tasted. The June edition features Nupur’s blog which I simply love mainly for her simple, unassuming and down-to-earth style of writing, and of course, her recipes. Sago looks yummy! Except vadas and wafers, I have never any other with Sago. Send Dahi dish to Siri's event. Hey TBC - i agree with you on how perfect and easy this khichdi is - Nupur's recipes rock. I added onions in my version so it's definitely not suitable for fasting anymore! 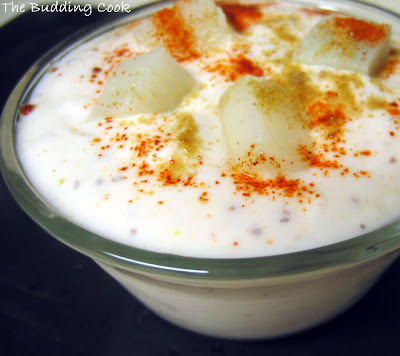 The dahi potatoes look lovely too. The addition of carrots gives it such a beautiful splash of color! Sago dish is new to me. I have never made anything from ago. But tha dahi wada looks so inviting, i wanted to grab the bowl and eat it. 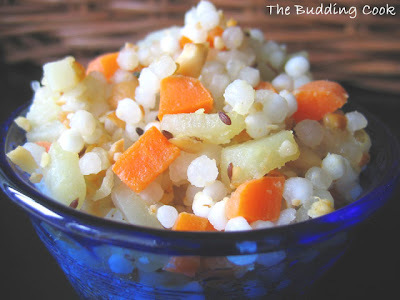 sabudana kichadi looks like a healthy snack.. I loved the sabudana khichdi too, plus many more recipes from Nupur's blog - such simple recipes and an unassuming demeanour! wow, that's a delicious array of Nupurs' recipes. Love your presentation, TBC! arre..why are you doing naatak of healthy eating with that carrots in huh :D..it looks great..never tried her MW version but have heard great stuff about it..all the food looks great! Isn't Siri's event about frozen yogurt though? Miri- yes, very true. That is why I find her blog so appealing! wow, someone likes to cook from One Hot Stove here :-) Lovely re-creations, I am sure Nupur is flattered to see someone makes so many dishes. I hope you dont mind if I publish them all. I wish you had the pics for the chutney and potatoes, too :-) you dont, do you?? ?